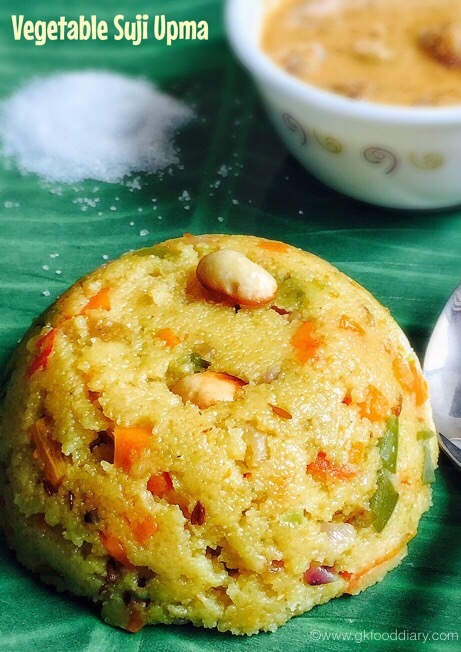 Suji Khichdi- Tasty khichdi or upma with suji & vegetables. Can be served as a breakfast or dinner. In a pan, roast the suji with little ghee until nice aroma comes. Set aside. Finely chop onions & tomatoes. Wash and chop the vegetables. Pressure cook or steam cook the vegetables until soft. Keep aside. Heat ghee in a pan, add cumin seeds. Let it crackle. Then add onions along with ginger and saute it till slightly browned. Then add tomatoes & fry until mushy and raw smell of tomato leaves. Now add the mixed vegetables & turmeric powder. Saute the veggies for a minute. In the meantime, boil the water until rolling boil and add the boiled water to the pan carefully. Now add roasted suji with continuous stirring. Be careful while adding, as it might spluttering. Keep mixing until the suji gets absorbed all water. Cook covered the suji or rava in low flame for 5 minutes or until its cooked completely. Add ghee fried cashews if desired and switch off the flame.